Not sure how this all ended so well. After two days of scrambling around the Sandias and a late night on Saturday, I was feeling rather sore and cross on Sunday morning. I was thankful Patrick didn't call until 9 am. Let's meet in Espanola at 10 am, all right. He called again 5 minutes later to delay our rendezvous until 10:30 am. Works for me. So we started hiking into the wilderness by El Rito early in the afternoon with ambitious plans. 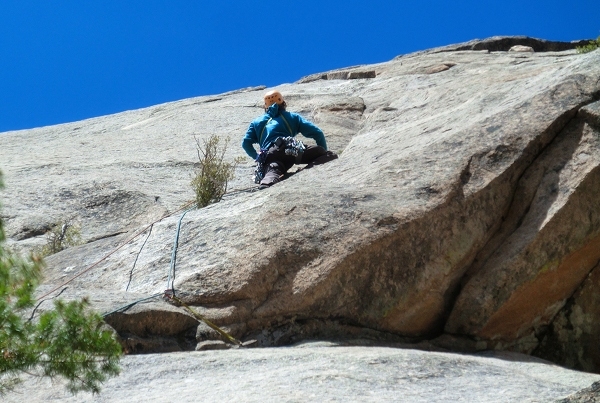 Naomi was psyched to lead some thin 5.11. I was game for a new route. Patrick was along for a proper Questa Dome baptism. I looked at the first pitch for a long time, because it scared me. 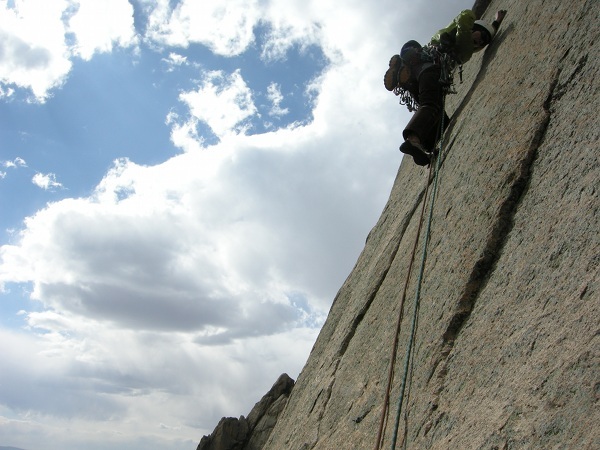 It starts with thin, steep parallel cracks; very awkward climbing with thin gear. 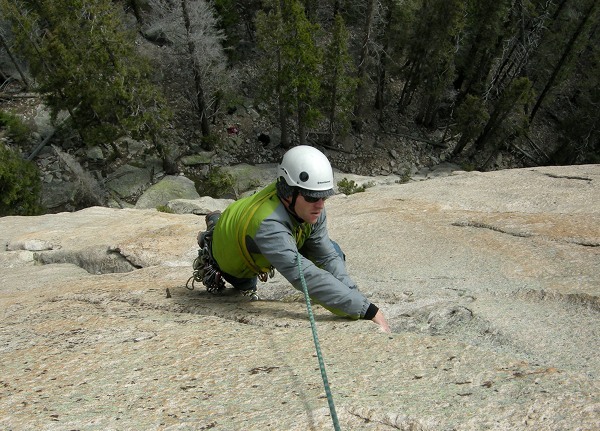 Visions of broken ankles beseiged my mind and I started with some "fraid" (free-aid) climbing. 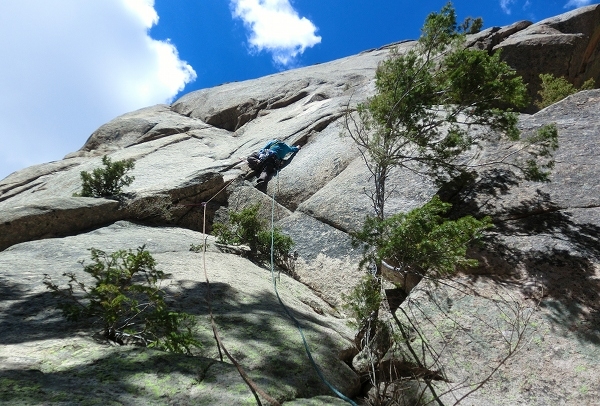 Eventually the climbing becomes unquestionably classic through the second half of this 50+ m pitch. Patrick follows the cool face moves on the upper part of the first pitch. Naomi got what she wanted. 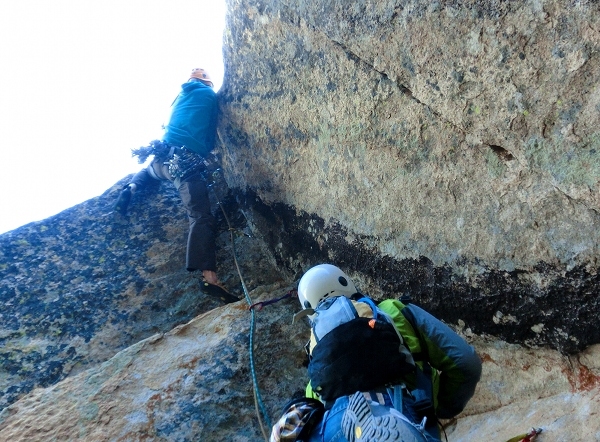 Here she moves past a bolt on some real live slab climbing. The winds were whipping fiercely; she was blown off thin cruxy moves several times but she persevered. Naomi prepares to clip from a "great stance" before a 25-foot runout. Perhaps Patrick wondered what his lead held in store after those first two pitches. 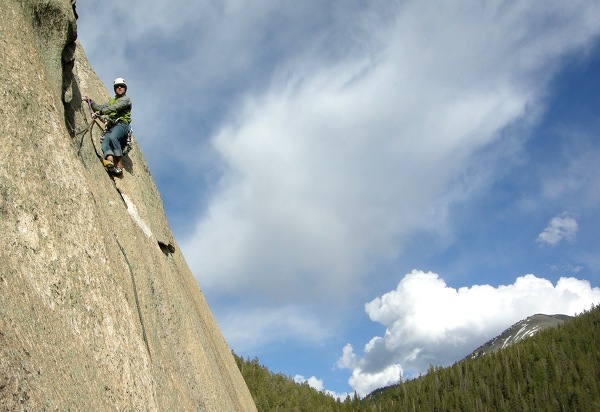 Patrick cruises through the classic crux move of the third pitch from "A Question of Balance." Looks like he liked it. For all our tenacity through tenuous terrain, I was rewarded with the rowdy roof. Hot damn that was a fun three days! I am one tired puppy today. "Fraid"- Love it Is that rock as grippy as it looks? The slab climbing looks fantastic. Way to go Naomi for working through it. How far is this from your place? Grippy? 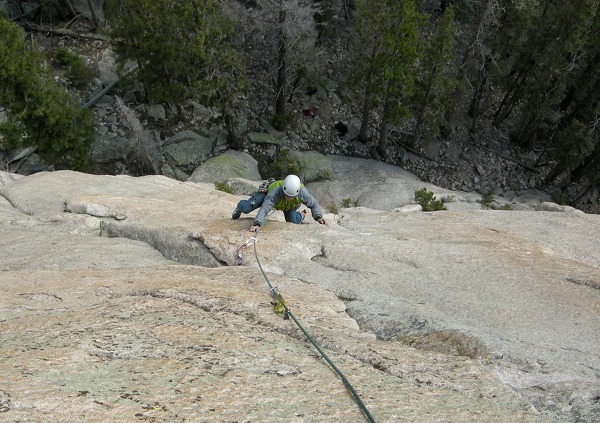 I always get gripped climbing on Questa Dome. It's some of the best granite I've seen but it does not have the magical sharp crystals, not as sticky as Squamish. Questa Dome is north of Taos. The drive is a hair under two hours from Los Alamos. Those were super awesome and hilarious three days indeed. Before this weekend I thought Sky was the crazy adventurous one in our relationship and that I just tagged along, but after Patrick joined, I realized that I'm just as crazy as he is and that we do this stuff because I want it too. Way to end my month with Sky. I'm feel undoubtably ready to crush this summer. 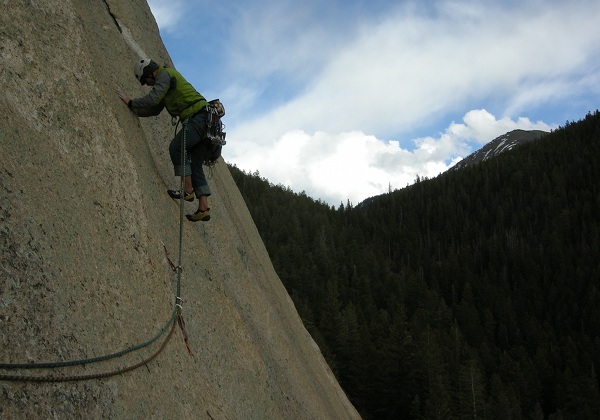 If anyone wants to climb in Squamish, Index, Stevens Pass or else where in WA just holler. Right on Naomi. Looks like you're crushing it. 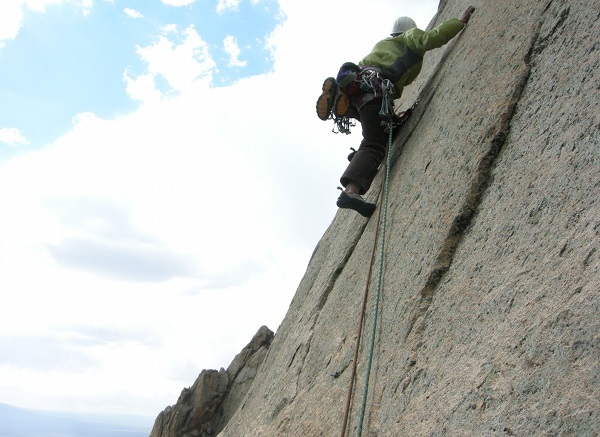 I'm always down to climb at Index and maybe I'll make it up to Squamish this summer.